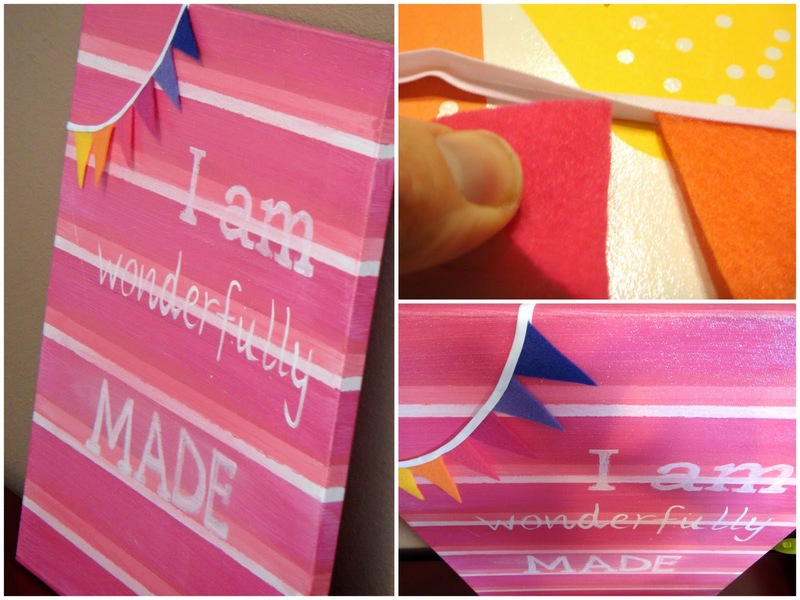 A Fuller Day: The one where I finally paint a canvas and why I chose these words. The one where I finally paint a canvas and why I chose these words. I think everyone needs to paint at least one canvas in her lifetime. You don't have to paint anything fancy. Even if you just paint the whole thing with your favorite colors, call it abstract art, and hang it in your bathroom. I by no means am an "artist." My mother is an art teacher and very talented which I attribute to my creativity, but she would still probably shake her head if she saw me sketch a person. I do better with abstract projects or things that I can make up my self and determine the rules! This canvas sat blank in my basement for 2 years. Finally I decided to actually attempt to paint something on it. I wanted to paint something for "Little Sister's" room, that was dark pink, said something meaningful, and had tiny flags incorporated somehow. I don't know why I love tiny flags so much, but I do. I decided to take a line out of the Psalm 139 passage. I wanted my littlest girl to have something on her wall that spoke even in just a four word phrase of the amazing truth that the Creator of the whole world also created her, and did so wonderfully. I also wanted it to be a visual for me when I go in to get her up every day, or put her down for a nap. No matter what my mood is, I will be reminded about this simple yet profound truth and I will be grateful. 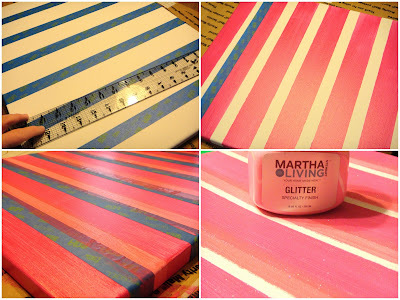 Here's what I did in case you want to paint your own striped canvas! I used some painters tape to measure out some hide stripes first. I painted them with dark pink, let them dry, and peeled the tape. Then I went back over part of a white spot and a pink stripe and created a new row of stripes. These I painted lighter pink. Then with the remaining small white stripes left, and over the rest of the canvas I painted some light pink "glitter luster" paint from Martha Stewart found at Home Depot. This created a sparkly effect. Then I cut out tiny triangles uses a small template I made out of cardboard. I used crafters felt. I took a piece of double fold bias tape and hot glued the triangle flags into the bias tape. Then I glued the flag strip to the canvas. For the letters, I could have been more patient and waited to buy some or get some stencils. I didn't want to wait, so I printed off the message on a piece of paper in the fonts I wanted the message to resemble, then I sketched them lightly with a pencil and painted them slowly with a tiny brush. Then I put one more coat of luster paint over them to dull them a bit. Here's another freebie for you if you love these words as much as I do! Read it and smile, or download it and let your creativity loose.